For years the kids of Miller had no playground other than a few broken down swings at the school playgrounds. Nothing in Marquette Park. 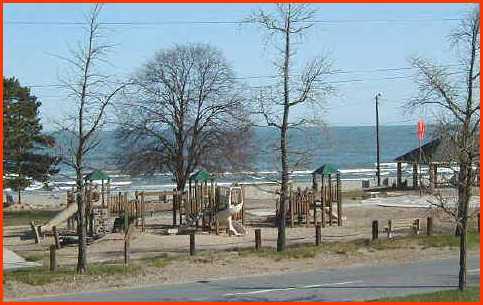 In 1996 a small group of people decided something should be done about that.The result was a magnificent playground along the beach east of the Aquatorium. The park was built with design help from local area children, a few matching funds, but mostly the hard work of volunteers who raised over $100,000 and pitched in to build the shelter, the central walkways, huge sundial and other great features of the park. One of the ways that the committee raised money was by selling engraved bricks. These are still available and you can memorialize, yourself, your parents, or anything else for that matter, with a brick. Back in 2000, a local lad, Joe Petras, organized a yearly fund-raiser called "Men and Boys," held on Christmas Eve to raise money for the Kids Park. "Men and Boys" is still raising money for maintenance and additions to the park and after 14 years raised over eighty-four hundred dollars. Then along came 2012-13. Marquette Park went through a thirty million dollar restoration. It was great, and the Kids Park was part of that. New play structures and new design. Almost nothing is left of the original other than the 'ore boat' that the author of this website had helped design and build. Play structures, in the original and in the new park were built and installed by Kidstuff Playsystems, a Miller Beach company. While the old park is gone, replaced by a new one, it's only right that credits be given to folks and organizations who were behind the original park. Without their labors the park might never have been and hence never replaced. Students at Nobel School picked out what play elements they wanted and that's what went into making up the playground. The kids at Miller School who collected their pennies and bought a brick. Nora Glenn, a tireless worker for the Playground Committee. The Navy Reserves, various trade unions, the Gary Fire Department, Ralph at Save-a-Lot, the Miller Garden Club, Lake Street Gallery and a great number of individuals who put in their time, money and labor. Meg Wolfe, a local landscape designer. Bill Laster, a construction planner and surveyor.